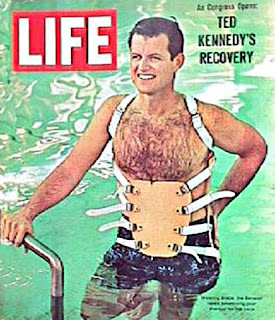 Came home to find Ted Kennedy had died. 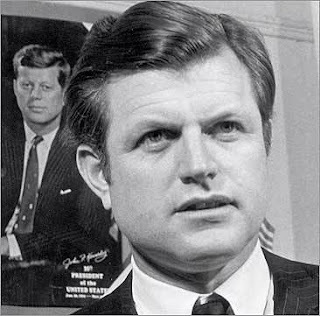 The only Kennedy brother to make old bones, he probably had higher natural political people skills, than the other Kennedys. Press accounts major on Mary Jo Kopechne’s death, his youthful cheating in a Spanish exam, and his failure to make the presidency. Of course Chappaquidick marked his political career deeply, and it could be that fear of its repercussions stunted ambition to run for executive office thereafter. So the moral is that all politicians are flawed, and members of the Kennedy Camelot more flawed than some. But apart from the President that Kennedy never was, what about the Senator he was? Kennedy was a New England Liberal from the age it was permissible to be such a thing and say so. His work in the Senate was his life’s work. He won every Senate race for which he entered, over 47 years. Not everybody in the UK understands the functions of the United States Senate, as an engine room of U.S. Lawmaking, especially on larger issues. Kennedy’s big achievements were as a man of the legislature not the executive. 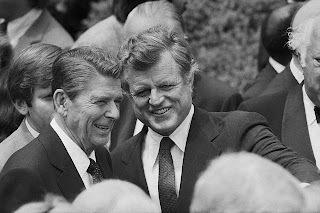 The skill of a good legislator is not just to read the background papers, something Kennedy was famous for doing rather than not doing, but also to formulate bills clearly and strongly enough to stand up to scrutiny on their way through the process, rustling up support, preferably from as many as possible of the other side. This is what Kennedy did superbly well, and the measure of his success is to be found in the particular legislation in which he had a strong hand — Deregulaton of airlines and truckers, abolition of the draft, voting at 18, the occupational safety and health administration, the Voting Rights Act, the Americans with Disabilities Act, and a mass of detailed legislation on civil rights, health, education, and labour. He was chairman of the Senate Committee on Health, Education, Labor and Pensions at his death. His private life seemed more Rabelaisian and indulgent than his public service, although he seemed largely to have gotten the act together after his second marriage. A man of the Vietnam generation, who came to object fundamentally to that war after various senate monitoring visits, he stood consistently against expansionist foreign policy, and also objected to the Iraq war — over-driven by the executive, under-respectful of the rights of the senate. You omitted entirely to mention that this patriarch of America's 'First Catholic Family' (TM) was a vocal supporter of Gerry Adams and Sinn Fein who prevented the RUC from buying US arms (while IRA surrogate Noraid collected money in Boston)- a true son of his British-hating father ambassador Joe. Kennedy also became the most prominent supporter of 'Abortion Rights' (including partial birth abortion) in the United States before Barack Obama arrived on the scene. His first marriage was annulled by the Catholic Church when he asserted he had lied about his promise of fidelity. All politicians may be 'flawed' but few as egregiously as Kennedy. Only the weirdness of Massachusetts Democratic politics, and his deft hand at playing it, kept him in a job he only gained through nepotism. What surprises me in your blog, Alan, is that you seem to have ignored how Kennedy abused US Catholicism and US Catholicism was complicit in this sham. 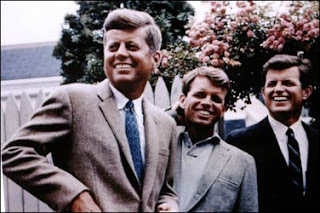 The whole Kennedy Roman Catholic thing was probably more significant to estabishment minded US RC's who saw them as having broken WASP hegemony than anyone else, and for political rather than religous reasons. I don't know how heavily TK played that card himself. There's an interesting article in this week's Tablet on Kennedy as a Roman Catholic — plainly as flawed an area of his life as any other, perhaps with less achievement on the plus side than the others. I sometimes think of the Kennedy kids playing round what is now the Legoland Mansion in Windsor early in the war. One of the more wearing things we've experienced this side of the pond in recent years has been soapy hypocrisy about terrorism from US politicians, some of whom spent years funding terrorist groups in Latin America and, exactly as you say, providing arms for the IRA to blow up London by massaging the fantasies of ignorant Boston widows. It's not a pretty tale, but I think I have to say the RUC, of course were the police, so they got their arms from the UK government. So you didn't want to publish my rejoinder with its medieval Latin allusion. As you wish. But note that Kennedy wasn't 'trashed' by the MSM; he was whitewashed. Dear Anon, I haven't seen your rejoinder with its medieval Latin allusion. It is five months since I last blocked any particular coment on the blog, spmething I have only done three times in over two years. - along with some observations on the temptations to political messianism. Anyway, I appreciate that while you are evidently leftish-liberal in your sympathies (like most of your confreres in the English establishment) you are not prickly about it.